As we all know, every cup can hold a certain amount of water. Once it’s full, any other water you pour in just spills over the sides. Humans are a lot like cups — but instead of holding water, we contain ideas and skills. If we get it in our heads that we know everything, then our cup is full, and anything else people show or tell us just spills over the edge. Grandmaster Ngo Dong teaches that keeping your cup full (closed-mindedness) is a limiting and undesirable way to live life, since a person can’t grow if his or her cup is full. When someone stops growing as a person, he or she loses the respect of others, and stops respecting others. That type of person is no fun to be around, to say the least. To prevent this turn of events, we must show discipline by emptying our “cups” (open our minds) at every opportunity and accept new learning. 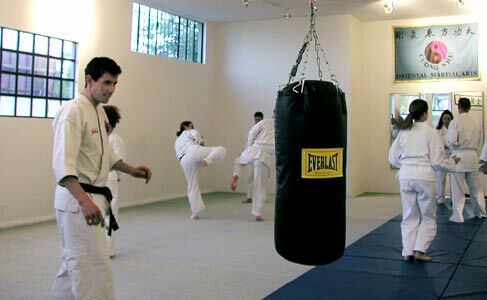 O’Sensei demonstrates this by constantly adapting and evolving Cuong Nhu techniques and philosophy. We should also strive to empty our cups in Cuong Nhu, and in life outside Cuong Nhu. One of the ways we keep an empty cup in Cuong Nhu is to accept the teaching of our black belts at first without question. Try to forget the other skills and knowledge you learned before. This means removing your ego from the situation, which can be hard. But the rewards can be worth it: who knows — you might learn something you hadn’t thought of, or something better than what you already knew. That isn’t to say black belts are right and you’re wrong, though. It goes both ways: Cuong Nhu accepts the teachings of many different styles, and also the criticism of its students. Once you show respect and discipline by honestly trying the Cuong Nhu way, any constructive criticism you have will not be ignored. One way to keep your cup empty in life outside Cuong Nhu is to listen before you talk. Show discipline by letting someone express a viewpoint you disagree with. Once you have emptied your cup to take in an opinion you disagree with, you will have a much clearer understanding of the situation. And you will have shown respect for other people by listening to their points of view. That’s not to say you have to agree with other people, though. You are entitled to your opinion, and should express it. But, if you are willing to listen before you talk, other people will respect your opinion more when it’s your turn to talk. There is a whole world full of ideas out there, just like there are infinite ways to perform Taikyoku. Ideally, everyone would understand everything, and be able to perform Taikyoku 1,000 different ways. But, that’s not realistic. The most we can hope for is that everyone will make an effort to grow. Of course, everyone has their own opinion, and everyone will develop their own way of doing Cuong Nhu techniques. But if we all try to empty our cups as often as possible, we will have enough information to be sure we made a wise choice. And if we still keep our cups empty, then we will never stop growing, both in Cuong Nhu and in life.